As tensions build between Jefferson and Gambi in the wake of the revelations of Gambi's role in the death of Alvin Pierce, Jefferson keeps trying to work to clear Black Lightning's name and train Anissa only to discover that Jennifer has begun to manifest super powers as well. The Black Lightning comics of Tony Isabella. It really doesn't help Black Lightning's case that he's innocent of murder if he's threatening to kill a prominent corporate lawyer with a lightning ball if he doesn't get help. China Anne McClain manages to make Jennifer's fears over her powers relatable without making her seem like a self-absorbed brat. This is surprisingly realistic and her concerns over what her powers mean - like if she'll be able to have children like she wants to - explore a side of superheroes that is rarely explored. The final five minutes and the action sequence of Thunder and Black Lightning taking down the Green Light lab is probably the best the series has had yet. Jennifer makes a reference to Vixen - a DC Comics superheroine who draws her power from a necklace that lets her replicate the abilities of any animal. Two different versions of Vixen have been depicted in The DCTVU. It is unclear if Vixen exists on the same Earth as Black Lightning as a fictional character or if she is a real superheroine. The same is true of Supergirl, whom Lynn makes reference to. Gambi looks for the manufacturer of a directed energy weapon that could mimic Black Lightning's powers. Black Mamba venom is refereed to as the kiss of death. It is a fast-acting poison. Black Lightning: Yo... yo, you strike me as a good man. A good man who knows that a lot of the men he's working with ain't. Inspector Henderson: You know, it's so easy for someone like you. There's no rules. No one to answer to. Black Lightning: Yeah, well.. it ain't always easy, Brother. But neither one of us signed up for easy. Lynn: I know exactly what you're going through. Jennifer: Well, not unless you came in here to tell me you're Vixen. Jennifer: Anissa, I don't want to be like this. Anissa: This is who you are, Jennifer. This is who we are. And, listen, you can think of this as a burden. Or you can think of it as a gift, a blessing from God. Choice is yours. We are who we are. Jennifer: But that's the point! The choice is not ours! We don't have a choice! Doesn't that piss you off, just a little bit? Anissa: Not as much as the thought of a woman getting raped or beaten down because Thunder wasn't there to protect her. Black Lightning: Kill thousands of people every day with this poison you're making? Black Lightning refers to the destruction of the evidence that could have cleared him, which occurred in 108. Anissa refers to how she broke her sink in 101. Anissa refers to herself by the codename Thunder for the first time. Anissa tells Jennifer that Jefferson is Black Lightning. Alvin Pierce's file on the vaccine also contained references to a bribery case involving a local politician - Tobias Whale - along with the research regarding the vaccine. Lynn makes reference to Vixen and Supergirl, like Grace did in 103. It is still unclear if these heroines exist in the same world as Black Lightning as real superheroes or as fictional characters. There was a check to Alvin Pierce from BendsCORP in his files. Alvin Pierce would say GTC instead of Gotcha. The man Gambi shakes down for information about the weapons emulating Black Lighting's powers was named Thomas Hildago. Anissa tells Jennifer about her physical fight with their father in 106. Thunder has more fans on-line than Black Lightning. The weapons dealer who has the special energy weapons is named Caleb Scott. He lives at 1245 Goff Avenue. Gambi tells Anissa about his past with the ASA, though he does not identify them by name. He tells her about the lab he broke into and how he saw the bodies of some of the young people he helped to hunt down 30 years earlier. Gambi gives Anissa the super suit he made for her. Lynn confirms that she left Jefferson because of his being Black Lightning. Anissa knows how to read lips. The last time Jefferson and Jennifer watched a movie together was when she had the flu. Another solid episode. It's a bit jarring not seeing Tobias Whale given his prominence in the early episodes, but the tight focus on The Pierce Family only helps to sell the drama. 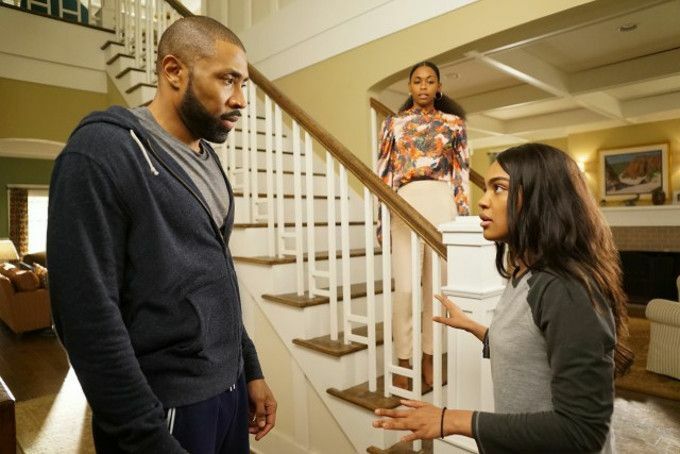 Despite this, the episode's final segment, in which father and daughter team up in the field for the first time as Thunder and Black Lightning is the best action sequence the series has seen yet.